Have you every wanted to throw a birthday party for your cat (or dog or ferret or rabbit) and just didn’t know how to go about it? Well, you’ve come to the right place! If you follow Kitty Mojito on social media (IG:@kittymojito), you know she likes to celebrate any chance she gets. This year, she celebrated her 7th birthday on the 1st of April. The theme was ‘magical unicorns’. So what goes into making a pet birthday party a success? That’s an easy question.. Just like throwing human birthday parties, the first thing to do is pick a theme! Not only will you save money this way (you will avoid buying random this and that), it also helps you stay organized and on budget. Once you have a theme, now comes the fun part of shopping for décor. Unlike kids’ parties, when you are throwing a pet party, keep your décor in a designated area. All my décor came from Facebook Marketplace. It cost me about $60 for it. I highly recommend buying used items. Not only it is good for your pocketbook but reusing is so much better for the environment. What’s a party without birthday cake? I made this super simple cake for Kitty. It is salmon, flour, egg and water. Take a can of quality salmon. Add it (with the salmon juice) to a bowl with 3 tbsp. of all-purpose flour. Mix it all together until it is a thick batter. Grease a muffin pan and the fill each section. Bake in a preheated 350C oven for about 20 mins. Let it cool. Once it is cooled, take a wet treat that comes in tubes (we really like Tiki Stix or Churu treats) and spread it on top like icing. It is ready to be served! Also, don’t forget to have some treats for the humans! I kept it simple with the non alcoholic cocktails, vegetarian appetizers, fruit and cupcakes. Kitty had a few friends come over to celebrate. To avoid a cat fight, I invited each guest at a different time slot (Kalea came over in the morning while Oscar came over in the afternoon). This ensured that they each had a great time and was not overwhelmed with many cats around at the same time. Each party guest went home with a goody bag! Party is in full swing! Finally, let’s talk about the party outfit! This lovely dress was gifted to Kitty by her friend Feona. I believe it was from Winners. The headband is actually a kids headband. I took out the plastic inside it and attached an elastic to fit her head. It took a few tries but it finally fit long enough for a few photos 🙂 Keep in mind that if you cat is not into wearing clothes, please don’t force it on them. Kitty is quite used to it so will cooperate but not all cats will like it! It was a great party. We got lots of compliments on the décor! Kitty was thrilled with the gifts she got. She got toys, treats and gift cards to go shopping! We are very blessed to have people who love her enough to make time to come for her party 🙂 She was quite exhausted by the end of the day. I hope you enjoyed ready about Kitty Mojito’s 7th Magical Unicorn Birthday Party. Please leave a comment and let us know your thoughts 🙂 We would love to know how your celebrate your pets. I, Kitty Mojito, celebrated my 6th birthday on April 1st 2018! Mama asked me to choose a theme for this year’s party so I picked a Pink and Turquoise “Sparkle and Shine” party! I was super excited to go to PetSmart to pick my party dress and Mama got some great decorations to set up a wonderful party table! I had 3 of my friends over on the 1st of April and we had cake and treats and even some goodies for the humans! Enjoy some photos from my epic party! Gifts from Jackson & Feona! I hope you enjoyed the photos from my party! Thank you to everyone who sent me lovely gifts, wishes and love! I came across NHV Naturals via Instagram. At that time, I wasn’t really looking to add any supplements to Kitty’s health regime but I kept it in mind in case I needed to look into it. Well, the need came sooner than later when Kitty started to get sick. If you read my previous blog post, you would know that Kitty had some stomach issues and was throwing up frequently. After visiting the vet and learning that there isn’t really anything wrong with her, I did some research and reached out to the lovely people at NHV Naturals to see if they can provide me some tips to help her tummy. I must say I was very impressed with the time they took to chat with me about Kitty’s condition, her symptoms, etc to try to figure out what is causing her to throw up. After a lot of discussion, I decided to add the Multi Essentials to her diet. One of the reasons I picked this product is that last point ‘filling nutritional voids’. I was concerned that Kitty was not retaining any nutrition from her food because she was throwing it up. Once I got my order in, I was instructed to introduce it slowly. I started with a few drops twice a day. After a few days, I increased it to 0.25ml. Once Kitty got accustomed to it (which took about a week), I began the recommended dosage of 0.5ml twice a day. 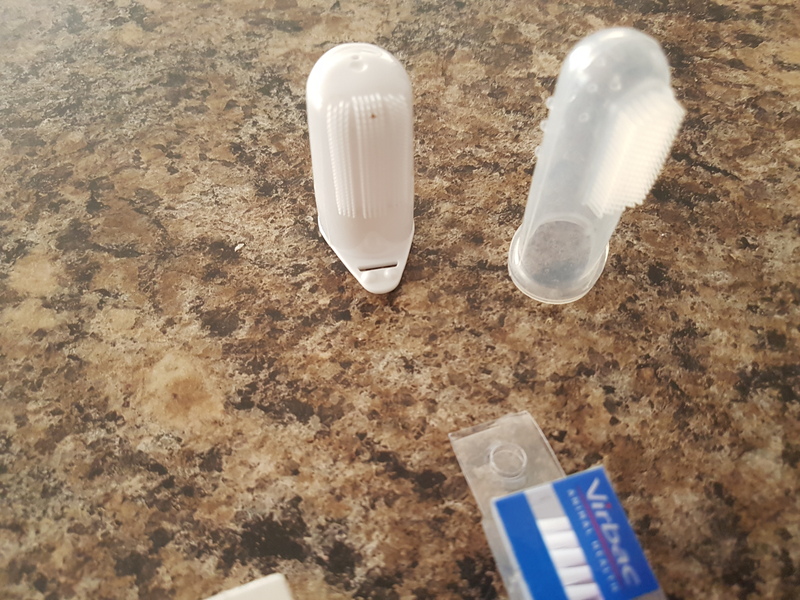 I found the dropper bottle easy to use as the dosage amount is already marked on it so there is no guess work. As a serial label reader, I was happy to learn that the supplements are made with natural ingredients and no artificial flavours or preservatives are used. One bottle would last about a 100 days. I suppose the biggest test is to see how she responded to it. I started the supplements on the 24th of October 2017. She took to it fairly easily. For an entire month, she didn’t have throw up incidents. I believe this was a combination of her new food, limited treats and the supplements. To end this review, I would encourage every cat parent to look into adding Multi Essentials to their cat’s diet. It will provide great support to your cat’s overall health. One thing to keep in mind is to make sure you give the supplements AFTER meals. Kitty had a couple of throw up incidents a few days ago so I am now mixing the supplements with her wet food to help her digest it better. For more information on a variety of supplements, please check out www.nhvnaturalpetproducts.com. When Your Cat Gets Sick – Are You Ever Ready For It? Several months ago, Kitty started throwing up her food. It started out as an occasional thing but soon progressed to a daily occurrence. I was very worried! Eventually, once a day turned into several times a day. A vet appointment was quickly made. Upon taking a closer look at her throw up, I could see that it was mostly undigested food. She would start to hack, then throw up the food and continue to puke until there is just bile and sometimes blood. I tried everything to help her little tummy, from feeding her small portions to making her dry food moist. I gave her chicken broth, pumpkin puree and limited ingredient food but nothing helped. Once I got her to the vet, it helped that I had kept track of when and how much she had thrown up and any behavioral changes so I was able to provide the vet with details of what had happened. We talked about the reasons why cats throw up such eating too fast and food intolerance to more serious conditions such as kidney issues and infections. After further discussion and a physical examination, it was evident that Kitty was physically in good health. There were no visible issues nor has she displayed any behavioural changes. I was given the option to do further testing to which I gladly agreed. I wanted to get to the bottom of this so Kitty was taken away for blood work and x-rays. I was eager to know the results. The x-rays turned out to be normal (such a relief!) and I was told that I will be informed of the blood results the next day. They also sent in for additional set of blood work to test her pancreas. It was a long 24 hour wait but it was worth it as the news was good! ALL her blood work was normal! Hurray! Even though it cost over $425 for all the testing, it was worth the peace of mind. In the meantime, the vet had suggested looking into switching her food into a gastro – friendly vet food. I was not too thrilled about pursuing that path so I did a bit of research to find something that could provide some relief for sensitive stomachs. I found that Halo pet food had a blend for sensitive stomach (Halo Food). The kibble was much smaller than usual kibble so it could help Kitty chew it better. I also found a food tree from Catit (Food Tree) which I figured would help slow down her eating. As I slowly transitioned her to her new food and food tree (it took her a good week or so to get used to it! ), I was fortunate enough to connect with a company called NHV Natural Products. They helped me figure out what I could add to Kitty’s diet to help her get more nutrients. I purchased their Multi Essentials For Cats. I also stopped giving her assorted treats and only give her a couple of freeze dried salmon or Greenies occasionally. Fast forward several weeks, I am so happy to say that she hasn’t thrown up since the end of October. She has been enjoying the Halo food. To keep things consistent, I have also gotten her on the Halo wet food. She takes 0.5ml of the multi vitamin drops twice a day which has helped her greatly. Having to deal with this situation only reiterated the fact that it is so important to know your pets. Paying attention to their habits and routine will really help you in times like this. Also, please get pet insurance! Even though the vet visit and testing was only $425, insurance covered 90% of the testing (THANK YOU, TRUPANION!). I had to pay a little over $200 (the deductible of $100 and the examination fee). Halloween is just around the corner! And this year, I had Kitty’s costumes ready to go since July! Since I kind of dropped the ball on it last year, this time around I started looking on swap pages and garage sales for some fun costumes for her a few months ago (I refuse to pay full price at the pet store!). Luckily, I went to a yard sale hosted by a local rescue organization awhile back and managed to find some super adorable costumes for a few dollars. So let me start by introducing ‘Wonder Kitty Mojito Woman’ ! Like the original Wonder Woman, Wonder Kitty Mojito Woman oozes style and grace. She is strong and powerful (like when she battles with the evil mousie), wise beyond her years and is full of love and wonder (why else would she let me dress her up?) Yes, I know Wonder Woman wasn’t blonde but hey! why blend in when you can stand out? Next, we move on to the Mad Hatter! Not sure what’s with the bunny ears but it is adorable! One of my favourite costumes this year is the Little Witch. She looks absolutely adorable in this costume and with a little coaxing, I was able to get her to sit long enough for these super cute photos! We also had a little fun with Batty Mojito and a simple pumpkin scarf that can also be worn as a skirt! And what Halloween without a good ol’ pirate lass! Arrr, so ye be wantin’ t’ go to sea an’ ye don’t be wantin’ t’ end up in Davy Jones’ Locker. Then ye best be learnin’ t’ be talkin’ like a buccaneer. I’m sure Kitty would love to hear your thoughts on her outfits! Please leave a comment and let her know! Have a super scary and fun Halloween! Hello everyone! It is I, Kitty Mojito! I am very excited to share with you all that I was interviewed by The Wondercat Crew for their brand new blog! If you follow this blog, you already know that I spend most of my Sundays interviewing my fellow felines for ‘Katdid Konversations’. When I was invited to do this interview, I was quite excited because now I get to be in the hot seat, talking about my life! I am part of the #wondercatcrew on Instagram. So head over to www.thewondercatcompany.com/blog/a-cat-with-big-dreams-kittymojito-interview to learn a bit more about me and what my life goals are! Let me know what you think about my interview! Don’t forget to give both blogs a quick follow so you can be in the know of what we are all up to!! A few weeks ago, Miss. Kitty had a vet appointment for her yearly vaccines! She was a great little patient and didn’t even flinch when she got her shots. Her weight was perfect (same as last year! Vet said I am a great cat mommy! Yay! ), her coat is exceptional and her overall health is great! EXCEPT………. for some plaque on her back teeth! Visiting Dr. Foster, dressed in her best bandana! Off to the vet in the stroller! OK, OK, it’s not as bad as I am making it out to be! During last year’s check up, Kitty had some plaque. I was advised to try brushing and use some dental treats to keep it from getting worse or look into getting her teeth professionally cleaned. This year, it is still the same. Luckily, it has not gotten worse, thank goodness! However, now I am being a bit more proactive in getting her used to the brush! At the vet clinic dressed in her best! 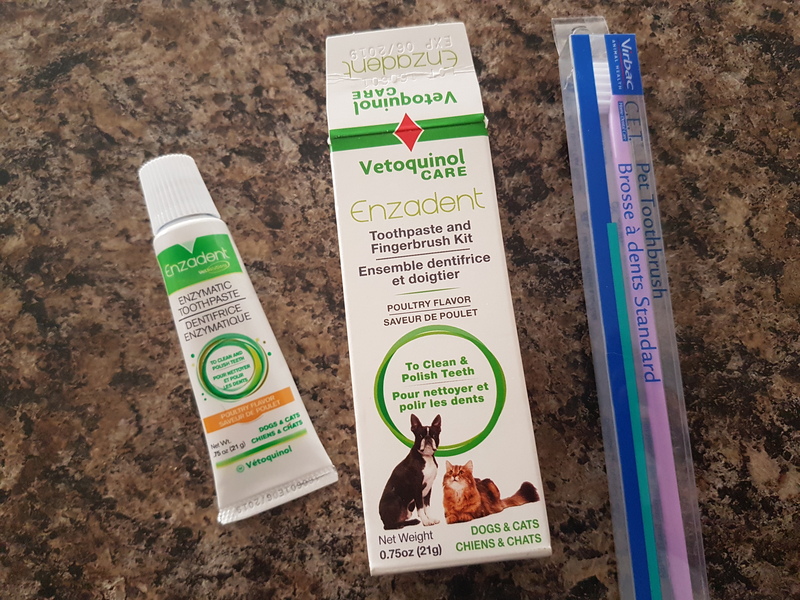 So, in this post, I am going to give a few tips to anyone who is interested in trying to brush their felines teeth! First thing is to find a toothbrush that your cat will tolerate. I have tried the ones that you put on your finger but I found that those are not as effective as an actual toothbrush. No cat wants your finger in their mouth! I got this toothbrush and toothpaste at the vet office. The brush has soft bristles and the toothpaste is poultry flavoured. Both got two paws up from Kitty! DO NOT USE HUMAN TOOTHPASTE! Please check with your vet or local pet store to get a toothbrush and paste made especially for cats! Before you actually attempt to brush, let the cat get accustomed to the toothbrush. I would let Kitty just bite on it and get used to it being close to her mouth. Then, I would put a bit of paste on the brush and have her lick it and taste it. She will try to chew on it which is great because she is slowly getting used to the toothbrush! The problem area for Kitty is her back teeth. You can probably see the plaque! This is not an easy place to try to brush. She is more comfortable having her fangs brushed than me trying to get to that pesky back teeth! It is very important to keep the cat in a comfortable position. For Kitty, it is sitting on my lap. I would hold her very gently and lift up her lip to reveal the teeth that needs to be cleaned. With a very calm and gentle hand, slowly rub the brush on the teeth. You can massage the gums gently as well. Do not put pressure on the neck or hold on too tight. You know your kitty the best so as soon as you feel that they are getting stressed, stop what you are doing. Leave it for another day! In the photos above, you will see that I am holding her neck VERY gently. It is just enough to support her head while I get those teeth cleaned. You will soon learn that you can’t brush it all in one go. So take your time and focus on the problem areas first. Kitty tries to bite on the brush and I let her do that as much as she wants. Then, I brush a bit more. It is never more than a minute or two at a time. Patience is key! Try to brush a bit everyday, even if it’s just one small spot. Use slow, gentle rotations. Kitty is a very patient cat so I have had better luck with her. If your kitty is not too enthusiastic at first, give them a dental treat and let them go on their way. Try again tomorrow! It is important that you keep trying. Not many pet parents pay much attention to the health and condition of their pets’ teeth until something serious happens. Be proactive and pay attention to their dental health. Watch for bad breath and bleeding gums! Talk to your vet about it at your next appointment. Dental issues will cost you thousands of dollars so best catch things before it gets to that point. As always, make sure your kitty is on a healthy diet and has access to lots of fresh water. Avoid food and treats that have artificial flavours and colours. Look for all natural, crunchy treats and use them in moderation. Dental treats are not a substitution for a good cleaning routine! If you have any tips, experiences with your own pets’ dental health, please share them in the comments! Hope you enjoyed this post! Don’t forget to follow the blog and share about it on social media! Tag @kittymojito on Instagram!